We love the detail that trim adds to a home. It can make such a difference in the quality of finish. 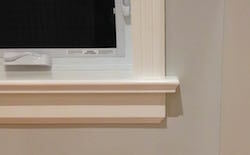 Replacing small trim with more substantial trim is not as challenging as you might think. If you have (or can rent) a miter saw and have patience to get joints tight, you can do this.